Enter the quantity of any product you wish to order in the box immediately to that product's left. Enter the Quantity, and select the Height, Mount and Color of the fixture you want, then click the "Click to Add Pole" link. The selection will appear above. Repeat the process to configure additional poles. Anchor Bolts may be selected immediately below this configurator. 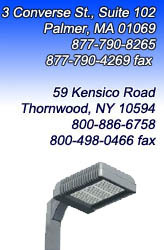 Click here for the Lighting Pole Spec Sheet. Have enough drivers for your Cooler Lights? Right-Click here and select "Save As..." to download a Driver Calculator (Excel Format).